It's ghost month in Taiwan and the middle of the month is the time for the second "bye-bye" in which offerings are placed on a table and tremendous amounts of "Ghost Money" are burned up. 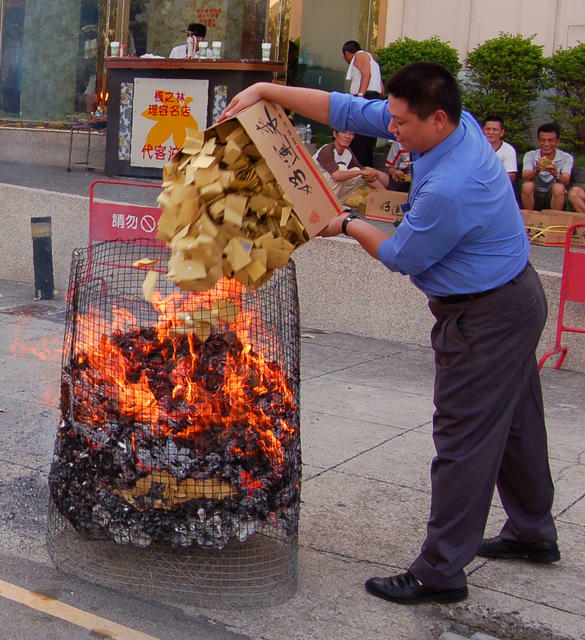 The manager of the "Barber Shop" KTV in Taichung, Taiwan dumps a box of ghost money into the burning fire. Also of note are the pictures of Preparing the boxes of Ghost Money, the table full of offerings and the Array of Ghost Money Burners on the street.